SAN FRANCISCO--(BUSINESS WIRE)--CloudCheckr, the enterprise cloud management platform, today announced a partnership and integration with Allgress, the AWS-certified compliance platform, which provides compliance controls mapping for NIST 800-53, PCI DSS, HIPAA and other standards. The integration enables Amazon Web Services (AWS) customers utilizing the CloudCheckr CMP platform to make compliance even easier by quickly checking and managing the compliance and cybersecurity of their AWS cloud in one unified view. 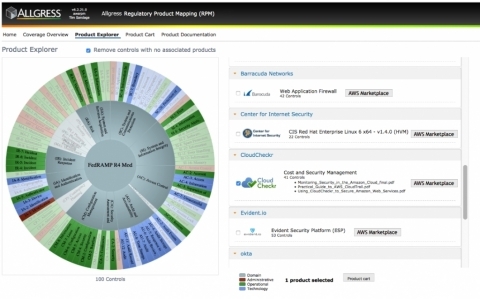 By integrating CloudCheckr’s 400+ best practices for AWS into Allgress RPM, customers can even easier prove compliance for their AWS environment by mapping the specific controls, including NIST 800-53 (FedRAMP), PCI, HIPAA and the Center for Internet Security (CIS), to their AWS services. When combined with CloudCheckr’s cloud security capabilities, customers get an AWS-certified solution to manage, monitor and control their security and compliance posture. With this partnership and integration, CloudCheckr customers can report on their compliance posture immediately by leveraging single sign-on from the CloudCheckr platform. Learn more by registering for an exclusive, online event on May 4th, 2017 at http://bit.ly/2nGbWeW. Visit CloudCheckr at Booth #1639 at the AWS Summit held today and tomorrow at Moscone Center West in San Francisco, CA. Allgress, is a technology and innovation leader specializing in Governance, Risk and Compliance solutions that enables risk, security, and compliance professionals the ability to efficiently manage organizational risk. By utilizing visualization, automation, streamlined workflows, and the integration of existing data feeds, Allgress reduces the complexity and cost of risk management. Unlike other risk solutions, customers derive value in hours rather than months. To learn more, visit http://www.allgress.com. The CloudCheckr Cloud Management Platform (CMP) provides full visibility and control to reduce costs, improve cybersecurity posture, and automate critical tasks to accelerate cloud agility for modern enterprises. DevOps, SecOps and FinOps teams from hundreds of enterprises, agencies, leading managed service providers and global systems integrators rely and trust CloudCheckr CMP to manage their AWS and Azure investments so they can quickly optimize spend, eliminate waste, and improve security and compliance throughout their cloud journey. Learn more about how CloudCheckr’s CMP can speed and enhance your cloud usage at cloudcheckr.com. CloudCheckr and Allgress announce partnership and integration to simplify compliance for the cloud at AWS Summit San Francisco 2017.